It would be really neat if there were a metal that was liquid at room temperature, didn't stick to skin, and was safe to play with, stick your fingers in, float on, etc. Up until a couple of decades ago there was: Mercury. Unfortunately it turned out that the "safe" part wasn't quite accurate. Mercury has gone from being something kids play with to something considered so toxic that even mercury thermometers are being banned, because they might break. Mercury in metallic form is dangerous, but it's organic compounds of mercury that are really bad. Once mercury gets into the environment it's very hard to get rid of, and it gets built into the food chain, which causes a cascade of problems as it works its way up to the food you're eating. Unfortunately, eliminating it from common use is not an overreaction. This is a real shame, because it leaves the world without a good liquid metal. Gallium-indium alloys are liquid at room temperature, but they stick to everything and are unpleasant, though not dangerous, to handle. Cesium is also liquid just slightly above room temperature, but it explodes on contact with moisture, which is inconvenient. It's not clear that there is any possibility for improvement, because the set of liquid metals to choose from is extremely limited. Tilt switch from old thermostat. I replaced an old thermostat at our square house in Urbana, Illinois in late 2001, and this is the tilt switch from it. It had probably been there for decades. A thermostat works by mounting this kind of tilt switch on a coiled bi-metallic strip, which coils and uncoils slightly as the temperature changes. When the switch tilts out of level the mercury flows to one side or the other, turning on the heat or air-conditioning depending on the direction of tilt. The weight of the mercury tips the balance slightly further in the direction it went, providing a built-in hysteresis effect. Back in the mid to late 50's he made a mercury switch...it was a glass tube with the mercury in it and it was then connected by a long electrical cord to our TV so when commercials came on he would "tip" the switch and shut off the sound!!! He made one for my grandfather and uncles he even got fancy and made a wood box around the glass tube to protect the tube from breaking and the left over Mercury my brother and I used to play with!! (horrors!!) I loved to watch the mercury split then pull itself back together again! This small glass vial came from Rob Raguet-Schofield's wife's coworker's parents who had it in their basement and didn't know what to do with it. They thought about burying it in the back yard but I took it off their hands instead. You have got to listen to the sound of this sample. This picture is out of date: I've since added more mercury that came from a leaking barometer I got at a school auction, and cleaned it all up by using a coffee filter with a pinhole in the bottom of it (a technique I learned from Timothy Brumleve). Amazingly, you can simply let dirty oxidized mercury drip through such a filter, and it comes out bright and shiny. The oxide is left clinging to the sides of the coffee filter. Of course, you wouldn't want to do that without protection against the mercury vapor and a proper way to dispose of the mercury contaminated filters. Of course, no one in their right mind, then or now, would expose themselves to this much mercury. But, man, doesn't it look like it would be an incredible experience? Mercury is so dense, and clings to itself so strongly, than the man floats on it like Styrofoam floats on water. The pressure inside a pool of mercury rises 13 times more rapidly than the pressure in a pool of water (because it is 13 times more dense). Imagine sticking your arm straight down into a pool of mercury: The pressure on your hand would be as high as if it were 20 feet under water. What must that feel like? I don't have to imagine! I grew up in [location deleted] and my father worked in the high power tube division of [company name deleted]. They would periodically have open house tours. I remember well one at about age 7. The plant where large [product name deleted] tubes were assembled was a large barn with a hard packed oily dirt floor. Some of these tubes were larger than 55 gallon drums; control rectifiers for pumped storage power plants, etc. There were open 55 gallon drums of mercury around to fill them. One of the tour demos was to see if you were able to completely immerse your arm in a drum of mercury. I remember the feeling of almost being lifted off the ground by the buoyancy of my arm deep in the barrel. The floor was covered with puddles of mercury. People worked there 8-10 hours a day. I never heard of anyone being poisoned. Of course one wouldn't, would one. My father occasionally brought home small amounts of mercury for me to play with. I had a couple of pounds at one time but gradually lost most of it. That was fifty years ago. I'm still here. All I can say is, I really, really wish that mercury wasn't so poisonous! A blood pressure monitor like this contains at least a cubic inch of mercury, far more than the typical thermometer. If spilled, that would be enough mercury to contaminate quite a lot of air or water. For that reason, such monitors should be treated carefully and ideally should be turned in to hazardous waste collection point in favor of an electronic model that uses no mercury. This one came from an Amish auction: Understandably they prefer this type to the electronic type, but that doesn't make it any less toxic. Click the source link for a story about the auction. You're probably not going to believe this, but I've wanted one of these since I was in my early teens. Really wanted one. I remember reading that the international unit of commerce in mercury was the "flask" which contained 76 pounds of mercury. I imagined this was something like a big barrel. Then at some point I learned that, no, a "flask" of mercury was actually quite small. Mercury is very dense (70% more dense than iron, for example), so 76 pounds of it is only about as big as a loaf of bread. Well, when I learned that, I really wanted one! This is war surplus mercury that had been at DePauw University since about the 1950's until Dave Roberts, bless his heart, decided to give it to me. I was there with Max installing the new periodic table display in their Julian Science Center when Dave gave us a bunch of elements he felt were surplus to DePauw's needs, including this flask and several more bottles of mercury to help top it up. It was really nice of him to let me walk off with the stuff, but really I'm probably doing them a favor. Mercury isn't very expensive if you ever want some, and it is so toxic that disposing of it probably costs more than buying it. So having an excess on hand, as DePauw did, can be a significant liability, and now it's my liability instead of theirs. Even though this cylinder is only about 3/4 full (it weighs 61 pounds total while full it would be 76 pounds plus the weight of the cylinder) it's heavy enough to be quite hard to lift, and the sloshing mercury is quite entertaining. This is a really neat, though broken, precision thermostat. It has a fine lead screw that allows you to adjust a very fine wire up and down. The wire is sticking down into the capillary tube of what is otherwise an ordinary mercury thermometer. When the mercury rises to the level of the wire it makes electrical contact with it, switching off the power to whatever heater the unit is controlling. This is is no doubt a much more accurate thermostat than the typical bi-metallic strip kind, and it is intended for scientific applications. This is a partially evacuated tube containing about 100 Torr of neon gas and about 5 grams of mercury. In a very dark room, after giving your eyes time to adjust, you can see flashes of light where the mercury is separating from the glass as the tube is rotated. Very strange. To keep accurate time, a pendulum clock needs a pendulum whose center of gravity remains constant. Unfortunately when the metal shaft of a pendulum warms up, it expands, shifting the center of gravity down and causing the clock to run slow. To compensate for this, glass vials containing mercury can be placed at the bottom of the pendulum. Not only is mercury nice and heavy, making for a good solid pendulum, it also expands more than most other metals on heating. Thus as the pendulum warms up the bottom of the vials moves down (because the shaft gets longer) but the mercury gets taller, shifting the center of gravity back up where it belongs. How much more accurate this made a clock I don't know: In any case a cheap electronic clock now is vastly more accurate than any of these ever were. Mercury lamps give off UV light, which causes tanning, which causes skin cancer. Despite this, some people choose to expose their skin to UV artificially, so people will think they are wealthy enough to spend the winter in Barbados or something. But I digress. This old (50-60s?) lamp make by Sun-Kraft contains a huge amount of mercury, about a cubic centimeter, which is way more than typical mercury bulbs. I have no idea why, and the lamp doesn't work so I can't say whether it makes a difference. Reader Keith McIver sent me the following two links to downloadable archives of a hilarious and informative promotional film made in 1946 by the manufacturer of this lamp. It comes in two parts: Part 1 and Part 2. Ah, things were so simple, so optimistic back then. These days we worry about subtle issues, like the difference between when UV light is beneficial and when it's harmful. I suppose they probably worried about it back then too, just not in promotional films by the makers of UV lamps. This device is designed to mix a carefully measured amount of liquid mercury with a small pellet composed mostly of silver. The mercury and pellet are automatically dispensed into a mixing egg, which you shake to mix the two ingredients. Then you pack the resulting amalgam into someone's tooth, assuming you're a dentist. It is claimed that such amalgam fillings can remain in you for decades without releasing their toxic mercury into your body. Fine with me if you want to try it, but when I recently had to have a bunch of fillings replaced, I was happy to choose the more modern ceramic/polymer alternative. I got this device on eBay, home of many slightly scary objects. It came with a full pound of high grade mercury metal, in what looks like an ordinary plastic bottle such as you might find containing eye drops or something. (A pound of mercury is very small, you see.) Needless to say it was not shipped according to the proper packaging and labeling requirements needed to legally ship such a large quantity of mercury. Unless, that is, there is a special exception for dental mercury, which would not surprise me one bit. A friend who works at a chemical company complains that a dentist removing a single amalgam filling and washing it down the drain releases, legally, more mercury contamination than their entire factory is permitted to release in a month. Kind of scary to see it so vividly. He also pointed out this absolutely fascinating study, which seems to demonstrate that cell phone or MRI radiation shortly after dental work with amalgam can accelerate the release of mercury. This is not as crazy as it might sound since the amalgam is conductive and could very well respond to radio and microwave radiation. What I want to know is where did they find "fourteen female healthy University students who had not used mobile phones before the study"? Are there really that many university students in the country who have never used a cell phone? Seems unlikely. And why did they all need to be female? Another example of the use of mercury for its ability to make and break electrical contacts. This relay contains, safely (I hope!) sealed up inside it, a considerable quantity of mercury. (So much that you can hear and feel it sloshing around if you shake the relay.) Magnetic coils, when activated, tilt the mercury chamber back and forth to roll the mercury onto or off of the electrical contacts. Of course it relies on gravity, so it has to be mounted in the correct vertical orientation, and it wouldn't work in space. There are three identical units because this relay was meant to switch industrial three-phase power, which comes on three wires. Mercury is used to this very day to make dental amalgams, tooth fillings made with a mixture of mercury and zinc. It's claimed that the mercury stays permanently locked in the filling and poses no risk, but do you really believe that? Last time I had fillings I asked them to use the alternative polymer-ceramic material. I have another sample of dental mercury which came with the necessary zinc pellets and mixing apparatus, but this bottle is much more attractive than the plastic eye dropper that came with that other one. I have no idea why this vacuum tube contains beads of mercury. If it gets hot in operation that mercury will vaporize and create a gas much better able to sustain an arc than is vacuum. That is the function of mercury in arc lamps, and presumably that is what it's here for as well. Mercury is not something you want to spill: Cleanup of a large mercury spill can be hugely expensive because it can get into the smallest places, and it's toxic enough that every last trace needs to be removed. So I'd say a fragile ceramic bottle would be about the last place I'd want to store 10 pounds or more of mercury, which is why this one is going to stay as empty as it arrived. In modern times bulk quantities of mercury are stored in iron cylinders that look at lot like compressed gas cylinders and are completely unbreakable. This is a huge 1000W light bulb (about a foot long). The high efficiency of metal halide bulbs means that it gives off as much light as a 3-4000W incandescent bulb would: This is a seriously bright light! It goes in some lights I have in the yard next to my lake, which I got from an old gas station (the lights, not the lake). Basically they are small street lights, like you see lighting up car dealerships or, well, gas stations. This bulb is listed under mercury because every metal halide bulb has a bit of mercury in it to form a conductive plasma for electricity to flow through. In addition to mercury a variety of rare earth metal salts and sometimes scandium are used to create a pleasing spectrum of light. These are 4V mercury batteries of a type that is no longer available. Somewhat alarmingly a quick web search turned up a memo from a pace maker manufacturer advising people that these batteries, used in their products, were no longer available and warning people not to use similar 4.5V batteries instead, as they would damage the pacemaker and cause it to operate outside of its proper "output voltage amplitude". Ouch. The memo further advises people to send their pacemakers in to be modified for use with 9V batteries instead. Although these are external, rather than implanted, pacemakers, one still has to wonder how exactly a person is meant to mail in the pacemaker that is keeping their heart beating. What are they supposed to do, beat on their chest for a week or two until the unit is returned? Honey!-thump-is-thump-the-thump-mail-thump-here-thump-yet-thump? As you can see there is one small, bare cell along with the three batteries, each of which contains three of those cells. Technically "battery" means multiple cells put together. A typical AA, C, or D battery is not really a battery at all but rather a single cell. 9V batteries, on the other hand, are genuine batteries because they contain 6 individual cells inside. A jar said to be used to store mercury in a dentist's office as late as the early 20th century. All fish contains mercury, and the larger, older, and fattier the fish is, the more mercury it's likely to have. Canned albacore tuna is big and old, though not terribly fatty, so it likely has an intermediate amount of mercury. Whether you think this is a problem depends on whether you trust the fish industry or the government less. Please note (especially if you are a StarKist corporate lawyer) that I am not singling out this particular brand of tuna fish as having more mercury than any other, it's just what I found at my local store. In fact, it's the kind I eat quite a bit of. A relic from an earlier time when children's toys were made of mercury. A fish made of solid mercury. Yes, solid mercury: If you cool it with liquid nitrogen, mercury becomes an ordinary solid metal very much like tin. Shot by Mike Walker and I for my Popular Science column. Mercuric sulfide (HgS) is the traditional pigment known as Vermilion and China Red as it is the traditional red of Chinese art. Rather toxic. Fish, particularly fatty fish like tuna, tends to contain mercury, largely as a result of contamination from coal burning power plants. The higher the fat content, the more mercury, and in the case of sushi, the higher the price. This is a mercury tilt switch thermostat of a type that was very common until quite recently. A bi-metallic strip coils and uncoils in response to changes in temperature, causing a glass ampule containing mercury to tip left or right, making or breaking a contact. This is a mercury tilt switch thermostat that contains two separate mercury tilt switches, one that tilts on when it gets too cold and one that tilts on when it gets too hot. This lets you set the heating and cooling systems to different temperatures. Nathan is a student who's going to visit my table this spring, and in advance of the visit he sent this lovely cinnabar sample. Cinnabar is the main ore of mercury: Simply heating it will drive off elemental mercury, which can then be condensed on a cold plate and collected. Mercury mines in Spain are famous for being so rich that liquid mercury can be seen literally dripping from the walls, but the bulk of it is bound up in cinnabar like this and must be roasted out. Remarkably, liquid mercury can be squeezed out of certain rocks. 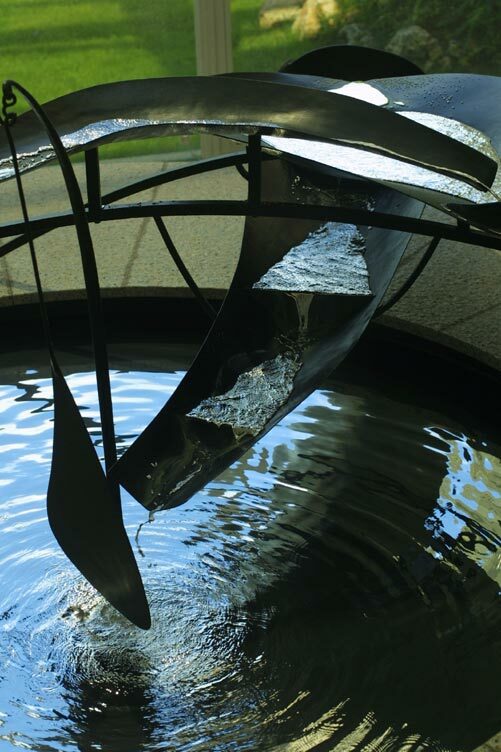 In the Joan Miro Museum in Barcelona, Spain, next to a drawing by some guy called Picasso, there is a remarkable object: A mercury fountain, designed by Alexander Calder. Now that's what I call art. Sadly I have not had a chance to visit this object yet, but I was alerted to it by Alexandra Cichecki of Amsterdam. I immediately started trying to think of reasons why my company should pay for me to go to a trade show in Spain, or at least somewhere in the general area, and I'm definitely going there eventually, hopefully with permission to make a QuickTime VR object of it. When it was originally installed in the Spanish Pavilion at the 1937 World's Fair in Paris, it was just out in the open, and presumably people could touch the mercury. Amazingly, it's still on display to this day, but now it's located in its own sealed glass room. I wouldn't be surprised if people enter only wearing elaborate breathing apparatus, because that room must support about the highest concentration of mercury vapor it's possible to have in air. The video for this sample is from borrowed the official Joan Miro Museum website and the sample photo is borrowed with permission from the home page of David Eppstein.